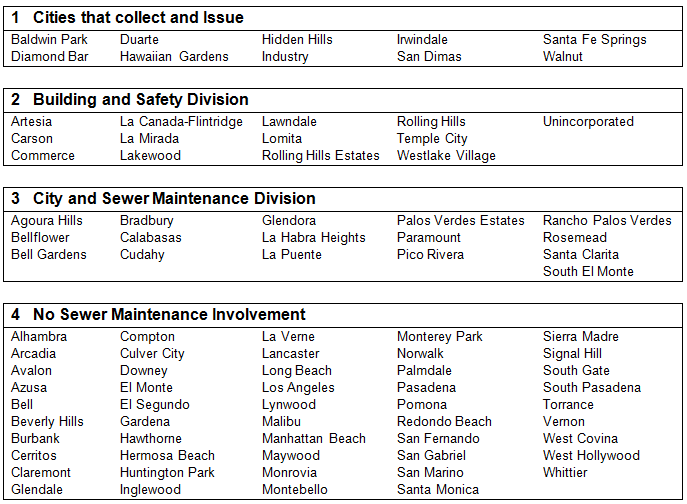 For sewers managed by the Consolidated Sewer Maintenance Districts of Los Angeles County, the Los Angeles County Code, Title 20, Utilities, requires that all saddle connections to the main line sewer shall be installed by the Los Angeles County Department of Public Works Sewer Maintenance Division. The following information is offered to assist contractors involved in saddle installation. For those jurisdictions listed in section 1 below, the saddle installation fee and the sewer connection permit should be collected at the city. For those jurisdictions listed in section 2 below, the saddle installation fee of $154 per saddle should be collected at the County Building and Safety Division field offices. An additional fee is charged for the sewer connection permit to connect the building to the lateral that will be installed from the saddle to the property line. For those jurisdictions listed in section 3 below, only the saddle installation fee of $154 per saddle may be collected at the Sewer Maintenance Division main office in Alhambra or at the Building and Safety field office. The applicant must still get a sewer connection permit from their respective City. For the cities listed in section 4 neither Sewer Maintenance nor Building and Safety Divisions has any involvement. Please refer your customers to their respective city offices. When it is necessary to excavate in the road right-of-way to install a tap and saddle or a new sewer lateral you must obtain a "Work in the Road Right-of-Way Permit" from either the City where the work is being done or from the Los Angeles County Department of Public Works - Land Development Division - Permit Section. Please contact the City or Land Development Division prior to beginning excavation to determine who will issue this permit. The issuing agency changes from year to year so it is best to call to find out who will issue this permit. The Sewer Maintenance Districts are equipped to install saddles on Vitrified Clay Pipes (VCP) only. Special arrangements will be necessary for saddle installations on plastic pipes. Allow additional time for non-VCP saddle installation. Notify the Dispatcher if a saddle is to be connected to a material besides VCP. The contractor must give notice 48 hours in advance of the time he will be ready for the saddle to be installed. There will be no installations on Mondays or Fridays, and none after 4:00 PM. Notice is to be given by telephoning the Dispatcher, Operational Services Division of the Department of Public Works at (626) 458-4357. They, in turn, will contact the sewer maintenance crews for the saddle installations. When telephoning the notice, the permit or receipt should be on hand since the permit or receipt number and other information will be required. The contractor will furnish the saddle. The Sewer Maintenance Districts' personnel will tap the pipe and install the saddle. The contractor is responsible for all excavations, barricades, lanterns, backfills, and resurfacing. In requesting the saddle installation, the contractor should keep in mind that the excavation must be complete before the County Public Works' forces arrive since they cannot wait on the job. The saddle installation is a separate operation from the laying of the lateral pipe that provides the house connection and from the connection of the building waste line to the lateral; therefore, after the saddle is placed on the main line sewer pipe, the contractor should follow the same procedure established by the Division of Building and Safety as for a house connection to a "Tee" or "Wye" Branch. Land Development will require the applicant to submit a sewer area study and will collect the appropriate fee for determining sewer capacity availability, per Section 20.32.250 of the Los Angeles County Code. Additionally LDD will request a flow measurement from Sewer Maintenance when warranted. Sewer Maintenance will conduct the necessary flow test and provide Land Development with the flow test data. If adequate sewer capacity is available, Land Development will provide the applicant with an approved copy of the sewer area study. The applicant will then submit the approved copy of the sewer area study and proof of payment of City connection charges to Building and Safety who may then issue the necessary permits. If adequate sewer capacity is not available, Land Development shall refer the case to the Sewer Advisory Committee (SAC) for the needed sewer upgrades and notify the applicant. The applicant will then prepare and submit required sewer upgrade plans to Land Development for review and approval. Following construction, Land Development approval of the facilities for public use, and confirmation of the connection charge payment to the City, the necessary permits may be issued. If a sewer saddle is necessary, Building and Safety will collect the installation fee specified by Section 20.32.200 of the Los Angeles County Code prior to issuance of the sewer connection permit.